Provide comfort for the family of Lieutenant Colonel (ret.) Hershel Ralph Lane with a meaningful gesture of sympathy. Lieutenant Colonel (ret.) Hershel Ralph Lane passed away at Hearthstone Health Campus on April 10, 2019. Hershel was born in Knox County Indiana to Frank and Jesse Lane on December 9, 1923. Hershel’s father Frank died when Hershel was a young boy leaving his mother to raise seven children by herself during the Depression. His mother remarried the local minister to help her raise her family. Hershel always said he and his brothers were a sad trial to the good Reverend. Hershel was preceded in death by his brothers Ellis, Herb, Ivel and his sisters Phoebe and Beulah. His younger sister Nelda survives. Hershel married Anne Lee Lane on June 6, 1946 and she passed away in 1994. His son David Joe Lane and grandson David Joe Lane, Jr. also preceded him in death. Hershel is survived by his daughter, Judith A. Sharp and her husband Stephen E. Sharp of Bloomington, Grandson Nicholas Josh Lane of Indianapolis and Granddaughter Mariah Anne Lane of Bloomington. He is also survived by his caretaker and friend, Jodi Hutchens of Bloomington. Hershel graduated from Decker Indiana High School in 1942. He enlisted in the United States Army after graduation. After attending basic training, he was given the opportunity to attend Virginia Military Institute. After a couple of months, he asked to be deployed to Europe where he served out the war. He received a Battlefield Commission to Second Lieutenant. Hershel remained in the Army after World War II serving in the Korean War and the Vietnam War. In peace time he served two tours in Germany and numerous postings in the U.S. Hershel retired in 1970 as a Lieutenant Colonel. Hershel was awarded the Legion of Merit, Combat Infantry Badge with Oak Leaves, Bronze Star and numerous other service related military honors. Hershel and Anne Lee moved to Bloomington after his retirement where he completed his Bachelor and Master’s Degrees in Education. He then taught at Eastern Greene County Middle and High Schools teaching History and Government for the next 12 years. He loved teaching and he said if it had been a different time he would have gone into teaching as a young man but duty and country called. Hershel had a long and happy life. His years in Monroe County were some of the best in his life. The birth of his grandson Nick and granddaughter Mariah were one of the best things that ever happened to him. He spent many years helping to raise them and enjoying watching both of them grow up. They were the light of his life. No one could have a better father or grandfather. We have been blessed to have him in our lives for so many years. The family wants to thank the nursing and support staff at Hearthstone for the compassionate care they gave Hershel these past few weeks. Visitation for Hershel will be Monday, April 15, 2019 from 11:00 – 1:00 p.m. at The Funeral Chapel of Powell and Deckard, 3000 E. Third St., Bloomington. Graveside services will be at 2:00 p.m., at Knightridge Cemetery. In lieu of flowers, the family requests donations in Hershel’s name be made to the charity of your choosing. 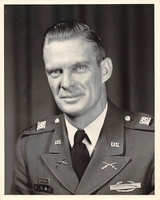 We encourage you to share your most beloved memories of Lieutenant Colonel (ret.) Hershel Ralph here, so that the family and other loved ones can always see it. You can upload cherished photographs, or share your favorite stories, and can even comment on those shared by others. Sorry to hear about Mr. Lane's passing, he was an unforgettable teacher and I enjoyed his class very much. Some of my favorite memories of living on Pine Grove Rd have been stopping by Hershel's house on the way home from work, having him meet me at the top of the deck steps, and asking me to "Come tell me a big lie". I always responded that "I just caught a fish this big", with my arms wide spread. We would then spend 15 minutes to an hour talking about his family, military past, Decker Indiana, his parents and the WPA, his siblings, the military and the places he went and the Generals he knew, his moving to Bloomington, his military travels in-state, and teaching at Eastern Green County. Each story had great memories attached and it NEVER got old hearing them over and over again. Each of my four children and my wife joined me at least one time on those visits. I can not, nor will I ever, be able to drive down Pine Grove without looking to his deck, and smiling as I recount the memories. He was a good man. I will miss him. I learned a lot from Mr Lane as my Social Studies/History teacher. What an amazing example of a “Life of Service”....and why his cohort has been called the “Greatest Generation”. I so enjoyed my high school history class with Mr. Lane! He was an enthusiastic teacher and genuinely liked young people. He was kind and often gave me a ride to my Grandma’s house in Bloomington fir my weekly ballet class. His good deeds and loving heart will live on! Incidentally, I never knew anything about his distinguished military career prior to teaching! What an amazing individual! Glad I knew him!